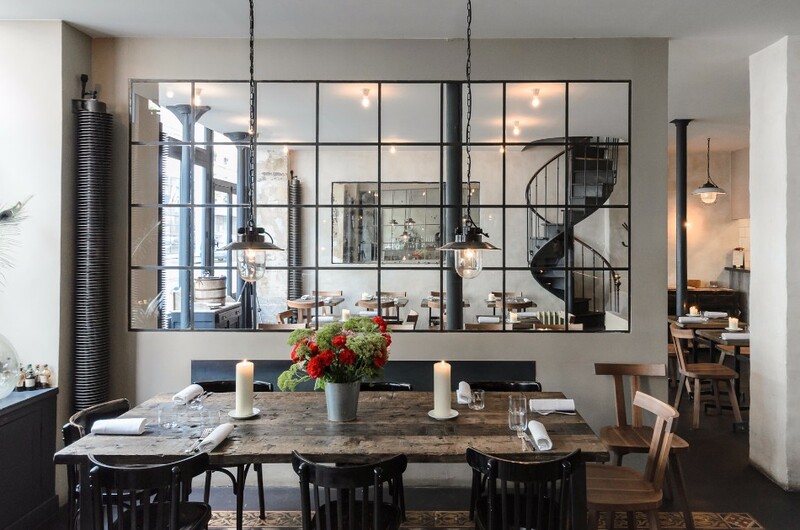 Today Modern Dining Tables blog will present you a brilliant selection os luxury restaurants in Paris. The concept of the modern restaurant – private tables, dedicated servers, a selection of finely cooked cuisine—was invented in Paris when chefs formerly employed in aristocratic kitchens were left jobless after the French Revolution: they opened public eating places to use their skills. Though the fledgeling institutions quickly became popular, the business was also very competitive, and restaurant owners soon realized that seducing clients with beautiful surroundings was almost as important as delighting their palettes. 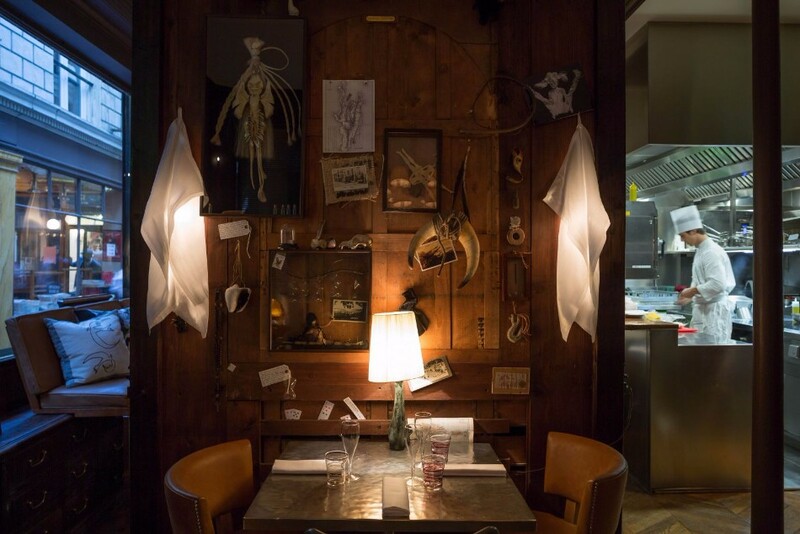 So restaurant design as a distinctive branch of interior decorating was also born in the French capital and has thrived in the City of Lights ever since. 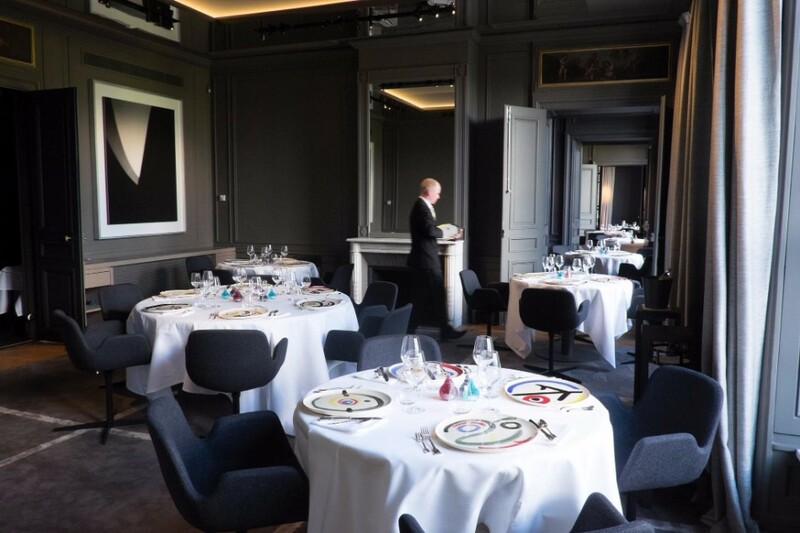 Both in terms of its cooking and its decor, chef Mathieu Pacaud’s new luxury restaurants Hexagone, which was just awarded one Michelin star, is intended to plot a new course for haute cuisine in Paris. 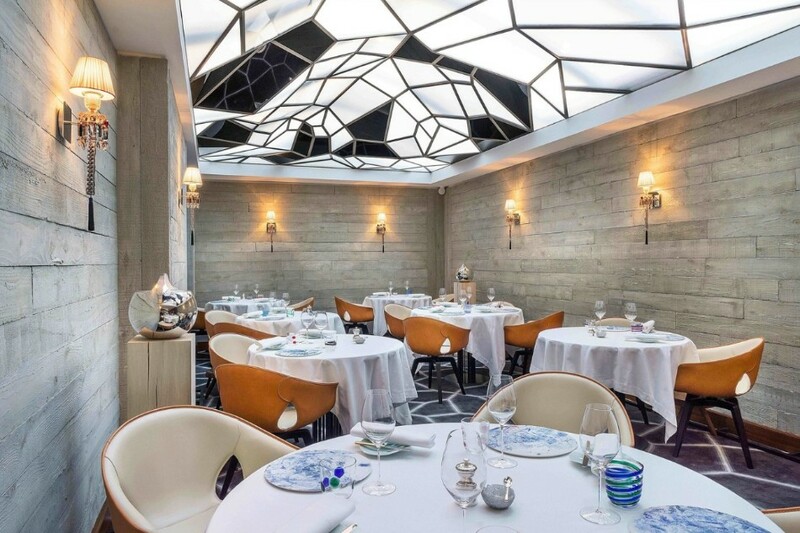 Light-years from the Renaissance richness of his father Bernard’s three-star restaurant, L’Ambroisie, in the Place des Vosges, Pacaud’s place was designed in a modern lounge style by interior architects Patrick Gilles and Dorothée Boissier. The space features impeccable lighting and tongue-in-cheek wall coverings and other graphics that were inspired by Alice in Wonderland. 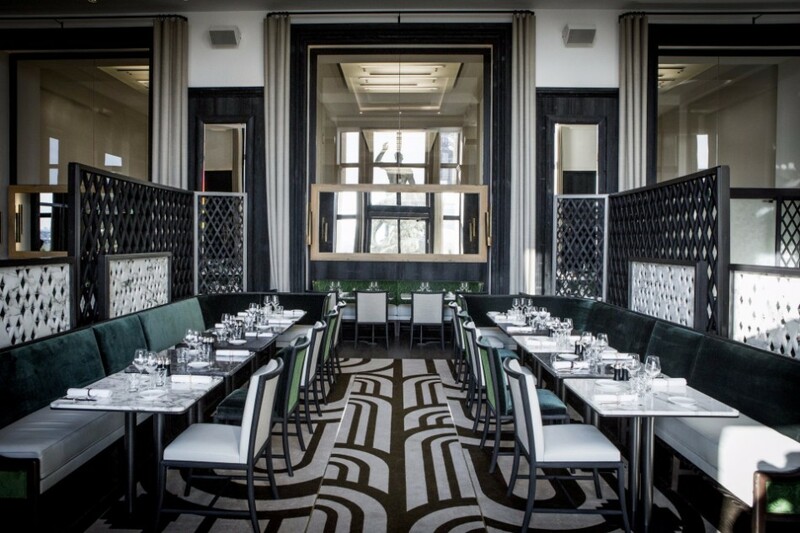 After a complete makeover by Gilles & Boissier, the mythic Café de l’Homme in the Palais de Chaillot has become one of the most stylish new tables in Paris. The design team respected the Art Deco decor of the 1937 building with views of the Eiffel Tower, the Champ de Mars, and the Jardins du Trocadéro, but made it warmer with sand-color cedar walls and ash-and-marble tables. Perhaps the key element of this design success, however, is the brilliant work of lighting designer Alain Guilhot; his subtle illuminations make the lofty room intimate and majestic at the same time. From antique mantel clocks to ormolu-framed mirrors to plush brocades in jewel tones, the elegant Grande Siècle decor of the dining rooms at the new Le Clarence is owned by Prince Robert of Luxembourg, president of Domaine Clarence Dillon, the Bordeaux wine company that owns three of the region’s greatest brands (Haut-Brion, La Mission Haut-Brion, and Quintus). While Le Clarence is meant to showcase Domaine’s wines, its look is intended to convey the tasteful opulence of traditional 18th- and 19th-century Bordelais design, which also serves as a racy foil to the inventive modern French cooking of chef Christophe Pelé. 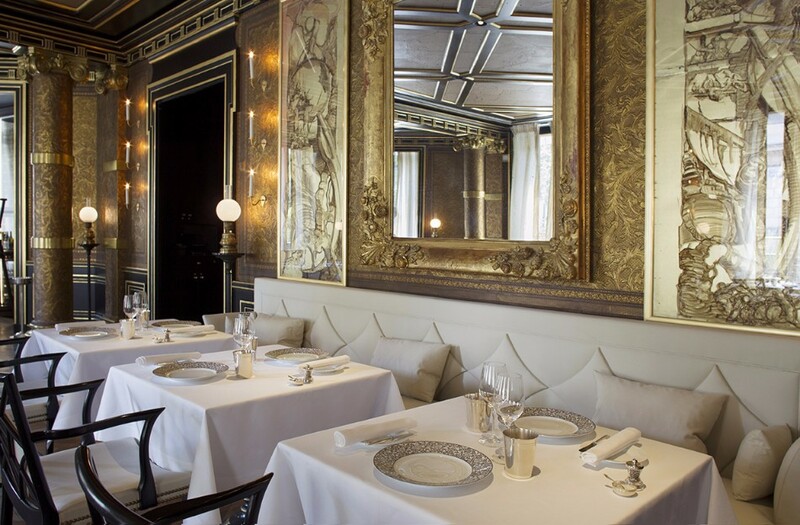 Tucked inside the 1854 Haussmann-style mansion that was occupied by the Duc de Morny until his death in 1988 (and is now a hotel, La Reserve), the sumptuously elegant Le Gabriel restaurant still has the embossed Cordoba leather walls original to the residence’s salon. Though respecting the vintage character of the room, decorator Jacques Garcia made it slightly more contemporary with bone-color leather banquettes and black lacquered chairs that riff. 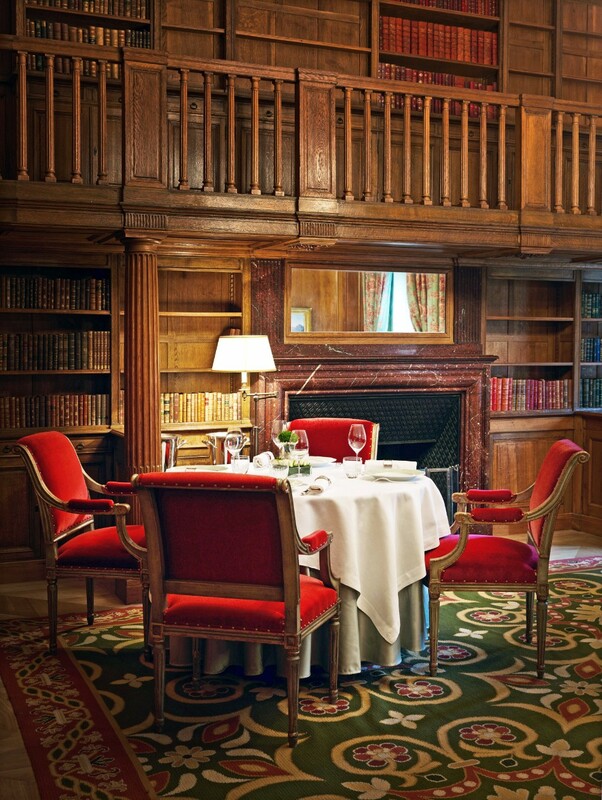 Chef Jérome Banctel has just been awarded two Michelin stars for his superb contemporary French cooking, too. 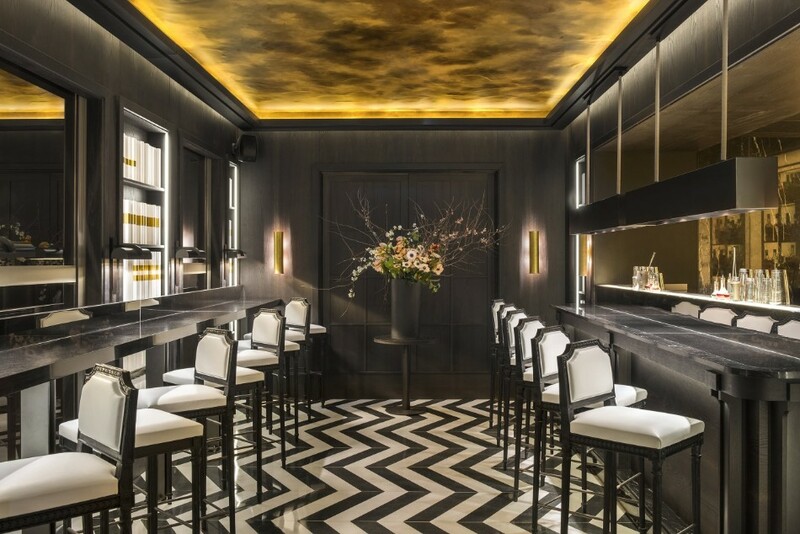 One of chicest new luxury restaurants in Paris opened last June and occupies a suite of 18th-century salons overlooking the Seine on the first floor of the Monnaie de Paris (Paris Mint), a magnificent neoclassical limestone building by architect Jean-Denis Antoine. 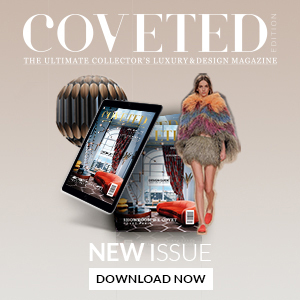 The understated look is the work of Paris-based designer Jean-Michel Wilmotte, but Guy Savoy himself bought the striking 1950s starburst chandelier by Italian designer Gino Sarfatti from a New York dealer. 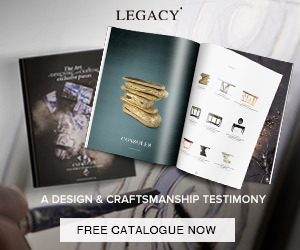 Additionally, much of the contemporary art on display comes from Savoy’s private collection, or was borrowed from his friend and customer François-Henri Pinault, the owner of the Kering group (Prada, Gucci, Bottega Veneta, and other luxury brands). The bold but elegant modern style of young chef Jean-Francois Piège’s new Le Grand Restaurant, which was just awarded two Michelin stars, is the work of Icelandic-born, L.A.–based designer Gulla Jónsdóttir. Upending the gilded looks often associated with serious luxury restaurants in Paris, her design begins with the striking white marble-lined open kitchen. 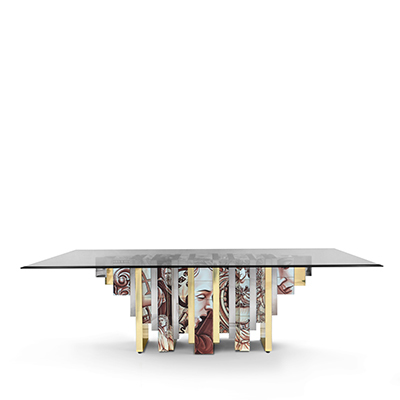 The intimate dining room features gray cement walls, Baccarat sconces, thick gray honeycomb-pattern carpeting, and a dramatic skylight that looks like it was inspired by Czech Cubism or salt crystals. Chef David Toutain is a rapidly rising star in Paris, and he’s also seriously interested in modern design. This explains the minimalist decor of his ryokan-like Left Bank restaurant with teal-blue walls and custom-made oak tables with ceramic insert centrepieces. 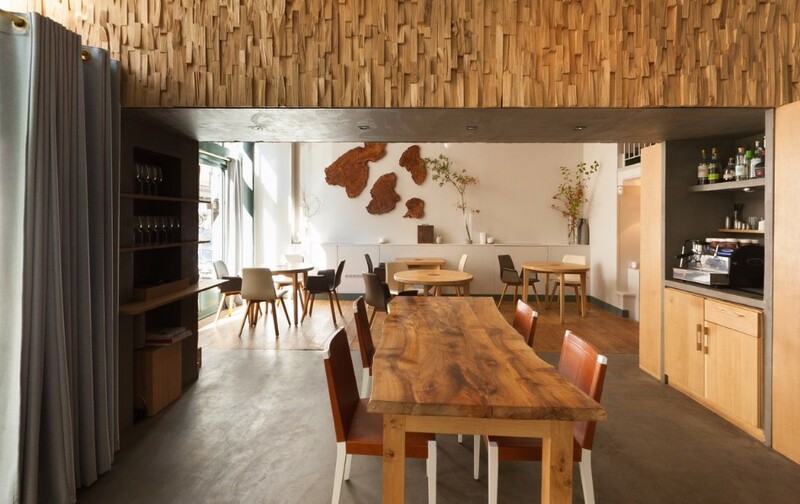 “The look of the restaurant is as much a part of the story I tell as the dishes I serve,” says Toutain, who selected all of the tableware, including recycled knives from an atelier outside of Brussels and bisque serving dishes from Belgian ceramist Pieter Stockmans. “I wanted to liberate good French food from expensive hotel dining rooms,” young chef Bertrand Grébaut, whose three-year-old restaurant Septime is one of the most sought-after reservations in Paris, told The New York Times. This explains the bohemian look he created in a former furniture workshop in eastern Paris. The twin dining rooms have polished anthracite-color cement floors, sleek Danish-modern chairs, and tables made from rough gray recycled wood. And there’s often a bouquet of flowers in a steel bucket on the bar. 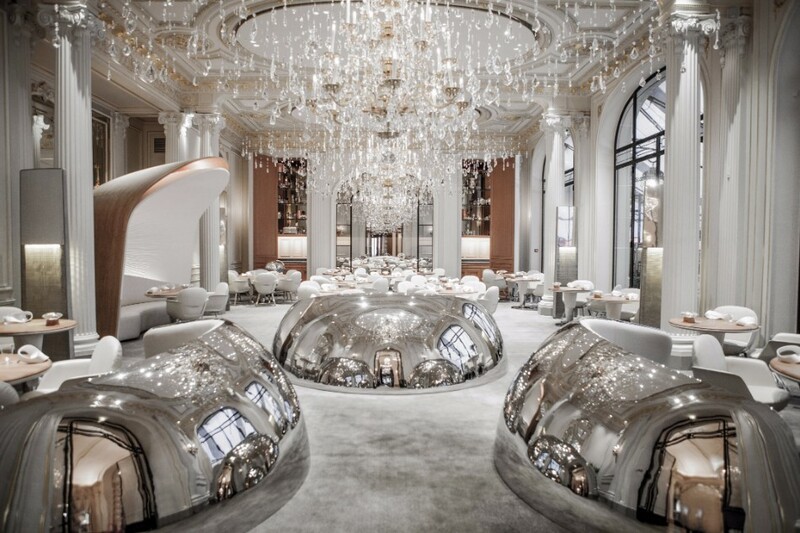 When deciding to launch a meat-free menu at his glamorous restaurant in the Hotel Plaza Athénée he named for himself, Alain Ducasse knew the place would need a new look. To mark the dramatic change in the kitchen, Patrick Jouin and Sanjit Manku centered the dining room on a deconstructed crystal chandelier, in which each piece of cut crystal is suspended from an invisible wire. 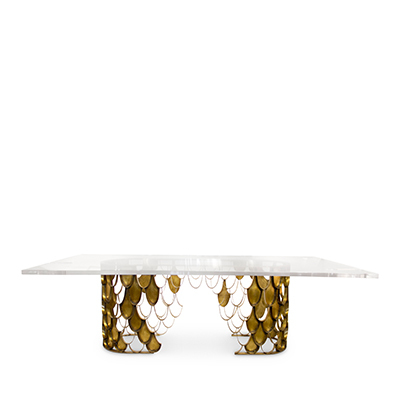 The duo equipped the room with a fleet of flying-saucer-style chrome banquettes and an oversize hooded loveseat. Clean, daring, and handsome, the new space has a certain 1960s retro-Futurist charm. Tucked away in the Passage des Panoramas, an atmospheric glass-roofed arcade in the heart of Paris built in 1830, this charming Italian restaurant with a witty toys-in-the-attic quality by Philippe Starck was once home to engraver and printer company Sterns, which moved to a new address several years ago. The elegant front windows of the café, a listed French historical monument, are today occupied by two stuffed animals—a wolf and a lynx—with rhinestone collars. Handkerchief lights illuminate the beautiful 18th-century wood paneling, moldings, and harlequin floor.